NEW YORK, New York, March 7, 2013 (ENS) – The fungus that has wiped out hundreds of frog species across the globe has been detected in amphibians sampled in Singapore for the first time, a warning sign that Southeast Asia’s commercial trade in these animals is spreading the disease. More than 40 percent of amphibian species are in decline globally, due not only to chytrid fungus, Batrachochytrium dendrobatidis, but also overharvesting, competition from invasive species, habitat loss, pollution, and climate change. High demand for amphibians through local and international trade is fueled by use of frogs as pets, food, bait, and as a source of traditional medicine, the study authors note. For the study, scientists collected samples from 2,389 individual animals at 51 different sites in Laos, Cambodia, Vietnam, and Singapore, including farms, locally supplied markets, pet stores, and from the wild. The molecular testing of samples was led by Dr. Tracie Seimon at the Wildlife Conservation Society’s Molecular Diagnostic Laboratory at New York’s Bronx Zoo. Frogs from Laos and Vietnam tested negative for the chytrid fungus. One frog from Cambodia intended for food tested positive. But 13 samples from Singapore tested positive for chytrid fungus and represent the first report of chytrid in Singapore. Eleven of the positive samples were collected from four pet stores and the other two were taken from amphibians in the wild. The scientists noted that the chytrid detections were most prevalent in the American bullfrog, Lithobates aka Rana catesbeiana, a common species in the trade and one that is tolerant of chytrid infections. “Finding chytrid in four of the seven Singaporean pet stores we sampled is cause for concern,” said lead author and Wildlife Conservation Society scientist Martin Gilbert. 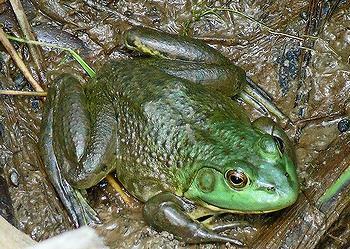 “Since the American bullfrog is able to tolerate this pathogen, it may act as a carrier for spreading chytrid to the region when it is imported through commercial trade,” he said. 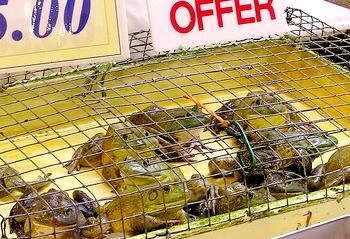 “In light of the fact that this emerging infectious disease is now known to be spread by commercial trade, it is in everyone’s best interest to eliminate it from the trade in live animals before both the native amphibian populations of Southeast Asia are affected and before it completely decimates the commercial trade and people are unable to make a living,” said Bickford. The scientists were alarmed to find that all 497 frogs sampled from 23 frog farms in Vietnam had skin lesions and deformed or missing digits in the most severe cases. Four of the animals had bacteria associated with the lesions that in two cases appeared to have spread to other organs. While the bacteria and its role as primary or secondary pathogen were not identified, the scientists warned that frog farms could serve as a source of infection for the wider environment. The study notes that lesions among frogs raised at commercial facilities in Vietnam are of particular concern. All of the farms in the study disposed of untreated wastewater directly into natural watercourses, which becomes an avenue to spread infection to other places and other species. The World Organization for Animal Health, OIE, requires its 174 member countries, which include the four countries in this study, to conduct surveillance for chytrid fungus, report confirmed cases, and implement measures to control their spread. They advise that these studies should focus on differentiating strains of the fungus that may be native to the region from exotic strains that may be introduced through routes including international trade.